Shawn Flynn (10) raises the championship trophy. A couple of previous scores was all it took to make this first-time viewer suspect accurately how this one would go. 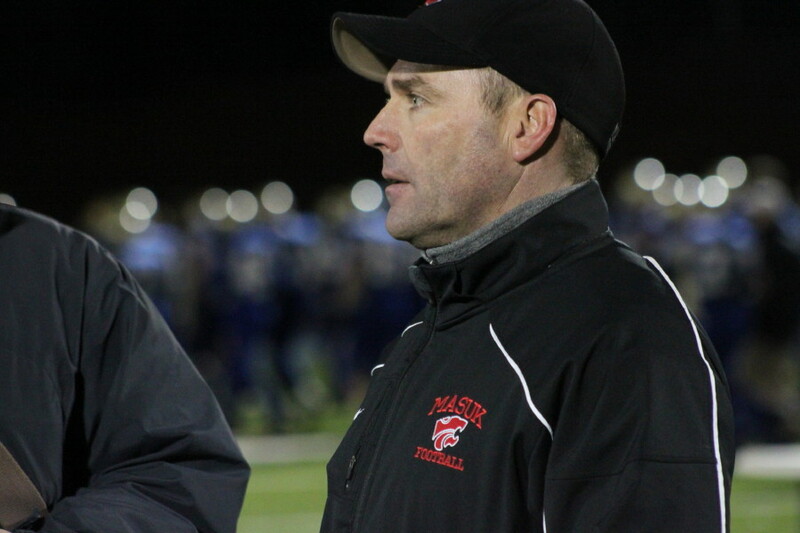 First: last year’s score between these two – Masuk 42 Newtown 0. 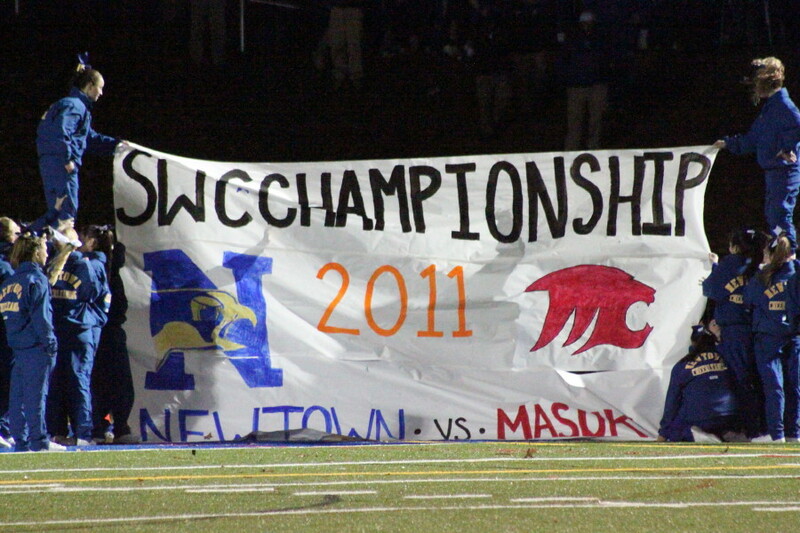 Second: This season Newtown lost to Pomperaug (16-7) while Masuk romped, 49-3, against the same opponent. Other considerations were Masuk’s 55 points per game average (tops in Connecticut) and a twenty-two game winning streak for the Panthers. As it turned out, the only real surprise was the weather. The forecast of rain was faulty, which turned out to be a blessing, because the game was switched from Masuk to Newtown’s wonderful turf field. 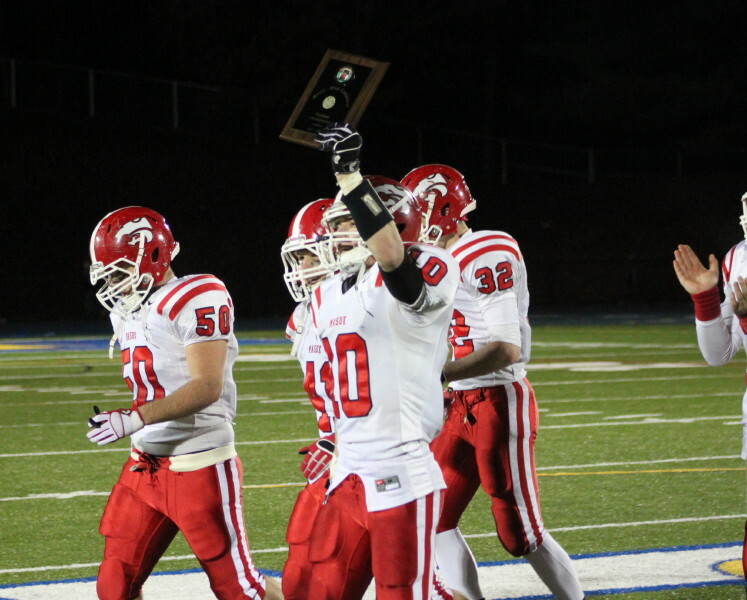 Masuk (10-0) with the win on Thanksgiving Eve captures the SouthWest Conference crown. It also qualifies for the Division L playoffs starting next Tuesday. Newtown (8-2) had qualified for the Division LL playoffs even before the Masuk loss. They won’t be facing schools the size of Masuk in the postseason. 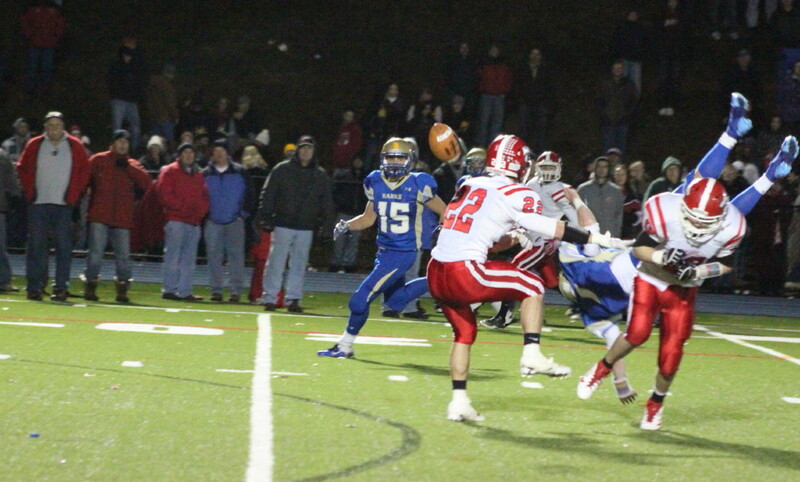 The Newtown defense shut out Masuk for a quarter which was a season first for the Panthers. 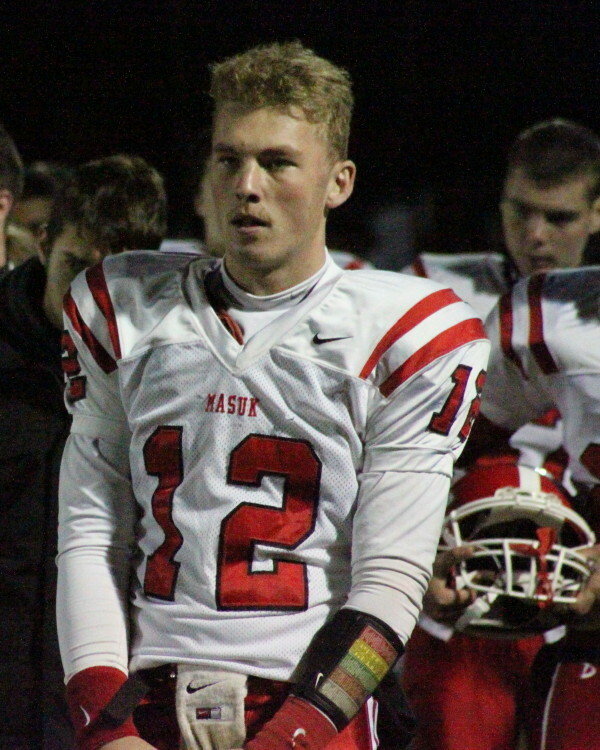 Masuk Quarterback Casey Cochran (12) had excellent protection. I thought that the Panthers believed that their passing attack, led by all-everything quarterback Casey Cochran, would work. Not on this day. The Hawks rushed few but flooded the secondary with defenders. Completions were few for Casey and his team ended up punting four times in the early going. The rest of the game the Panthers began to rush more and Thomas Milone (2 touchdowns) and game MVP Colin Markus (2 touchdowns) ran wild. Thomas was the carrier on counters. On one his first score, the faking of QB Cochran was so good that Thomas went into the end zone practically unnoticed by the Newtown defense. Colin Markus (32) with last Newtown defender Dan Hebert. 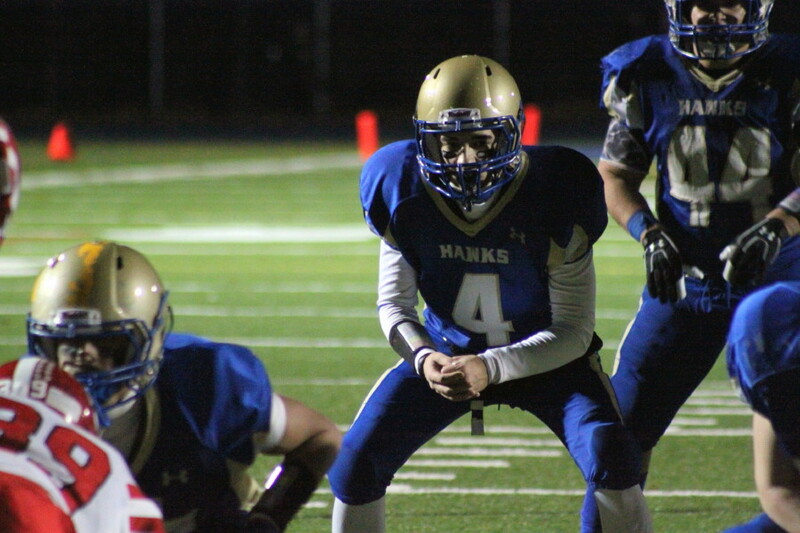 Colin was a Hawk problem from everywhere, as he frequently broke the line of scrimmage and got into the Newtown secondary. There were way too many instances of him being tackled by safeties. He also set up the Panther TD just before the half, taking a short pass from Casey Cochran and turning it into a 71-yard gain. The key play of this game could well have been the Newtown turnover (pick-six) in the second quarter. Down, 6-0, QB Andrew Tarantino tried a middle screen. 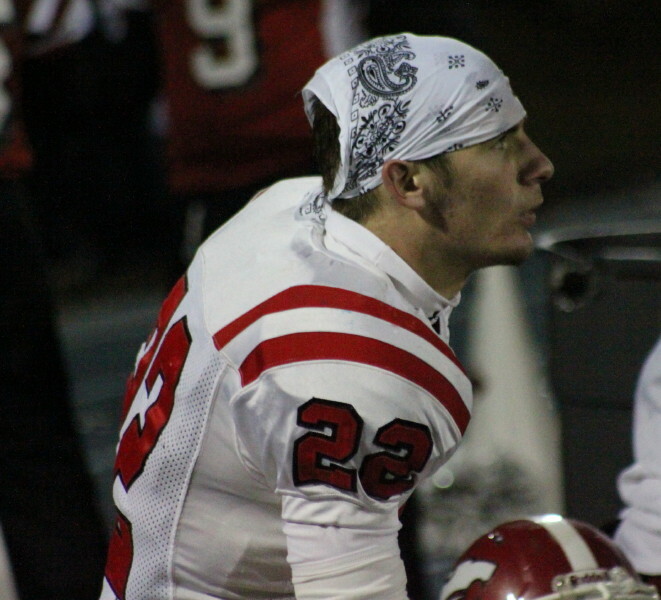 As my picture shows, Panther defender Pat Tripodi had a great look at it. He intercepted the underthrown pass and was immediately off to the end zone 43 yards away. Newtown’s shining moment was first possession in the second half. Trailing, 19-0, they put a 16-play, 79-yard drive together to close to 19-7. Dan Hebert, set up in Wildcat formation, found Julian Dunn wide open in the middle for the score. The momentum quickly shifted back to Masuk. They reached pay dirt 1 ½ minutes later and never looked back. 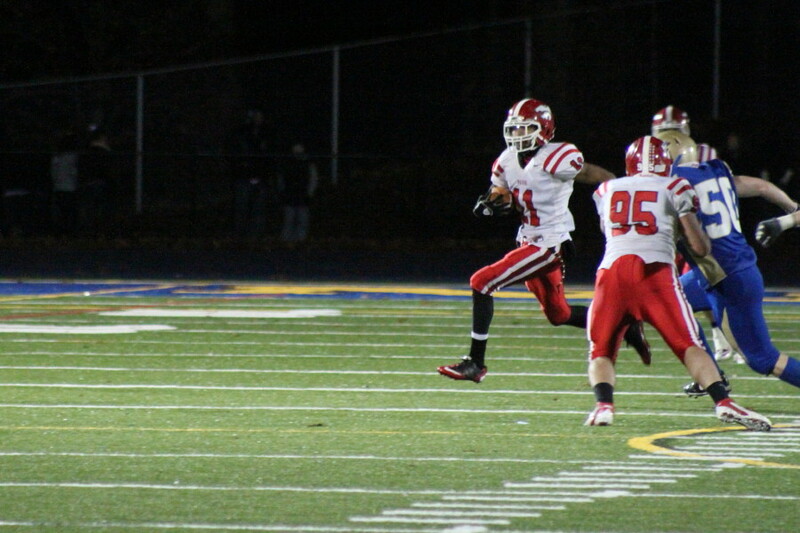 Nate Coleman (11) heads for a “pick six” as Brian Monaco (95) blocks. Late in the game, Panther defender Nate Coleman had a “pick-six” racing 65 yards. He got a good block from Brian Monaco to send him on his way. 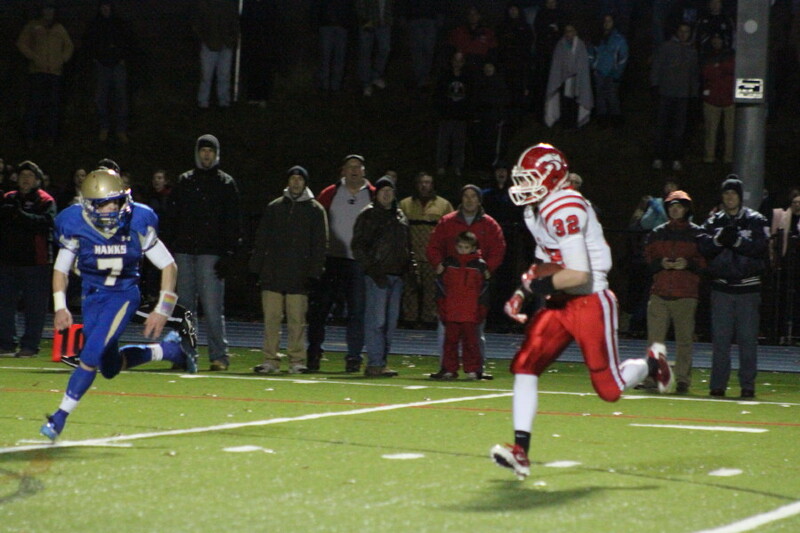 Masuk’s last score came with seven minutes to go. The only “worry” thereafter was the 50-point rule (Cochran Rule). Surely Jack Cochran (Casey’s father) was in the house. Jack Cochran won eight titles coaching in Connecticut. He picked up some heavy slack along the way, especially in 2005, when his team won four games by more than fifty points including a 90-0 score over Griswold. Hence the rule. Casey Cochran committed to UConn in August after being courted by a number of prominent schools including Boston College. 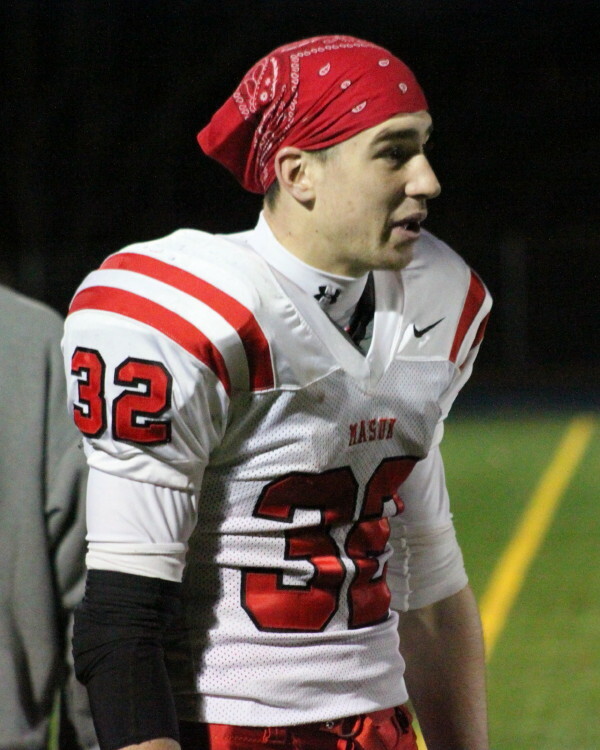 Casey’s plan is to graduate from Masuk in December and start at UConn in January. Casey was Connecticut’s Gatorade Player of the Year last year and should get that award again after this season. He holds the Connecticut career records in passing yards, completions, and touchdown passes. Casey played for his father as a freshman at New London. When his father was fired, they moved to Monroe where Casey has played, and set records, for the past three seasons. Masuk is ranked second in Division L behind undefeated Hand of Madison. Newtown’s Lou Fenaroli set a school record 1,598 rushing yards. 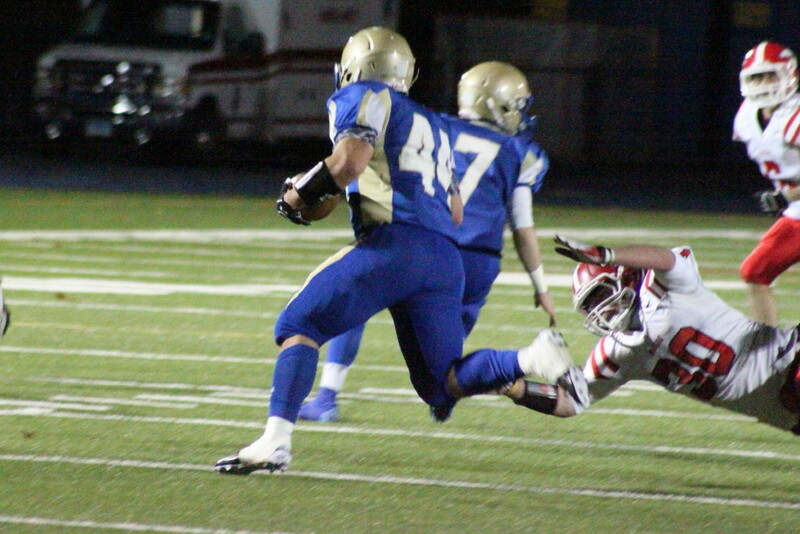 He led the SWC in rushing. 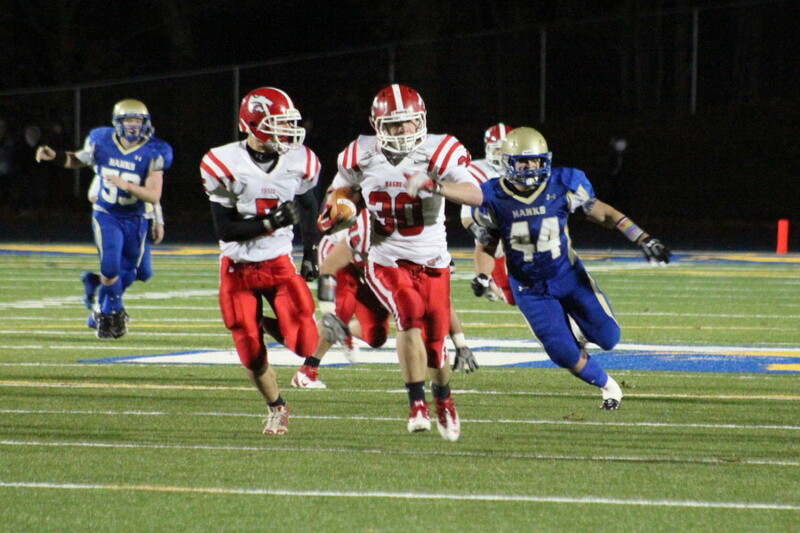 Another key to the Masuk win was the way they contained the Hawk running game. Lou Fenaroli was only able to get 59 yards in 19 carries. Denied the balance of a strong running game, the Hawks were forced to pass to get anywhere. The chant from the Panther side of, “You’re no Casey,” directed Newtown QB Andrew Tarantino, was accurate. Newtown’s turf field was terrific. The stadium was packed on a very brisk evening. The lighting on the field was about as good as it gets. (I take ownership for any “fumbles” in this blog entry.) Pictures will enlarge if you click on them. Masuk defenders break up pass. 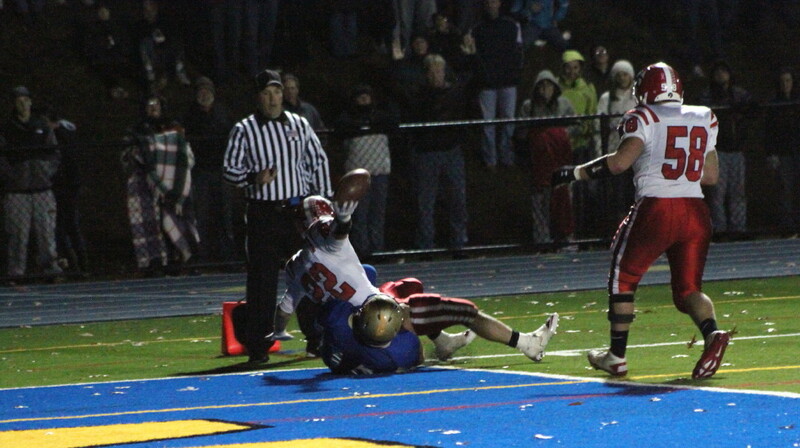 Thomas Milone (22) falls into the end zone on Andrew Cebry (14) as Nick Plescia (58) watches.